Serves 2 (or a very hungry one). Serves 4 as a starter. Start with the chilli dip: Finely chop/crush all the Dip ingredients. Mix all the ingredients very well in a small mixing bowl, pressing the chilli and garlic into the walls of the bowl to release the flavour as you are mixing. Alternatively use mortar and pestle and crush the ingredients for a more intense flavour! Set aside to marinade as you are preparing your rolls. Place all of the ingredients for the filling into the food processor and process until slightly smaller than the bread crumb consistency. Wash and remove the hard veins from the leaves you are using (especially for the white cabbage). Cut the Chinese or white cabbage leaves into approximately 4cm x 5 cm squares or simply use approximately 1/3 cabbage leaf per roll. 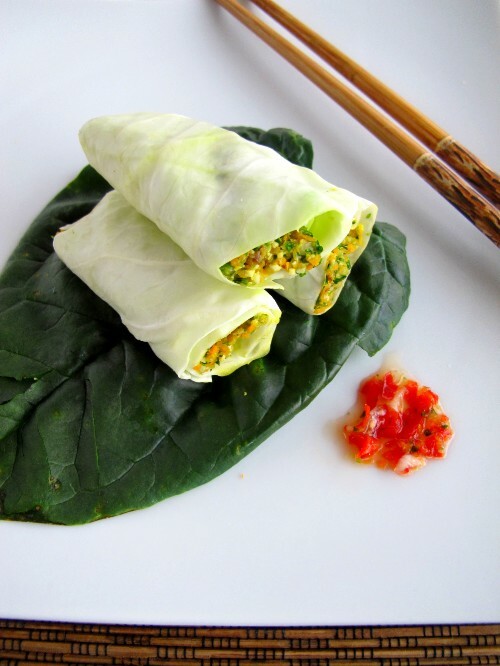 Into each cabbage leaf place around 2 teaspoons of the vegetable filling, lengthwise and slightly closer to one edge and roll into small neat rolls.